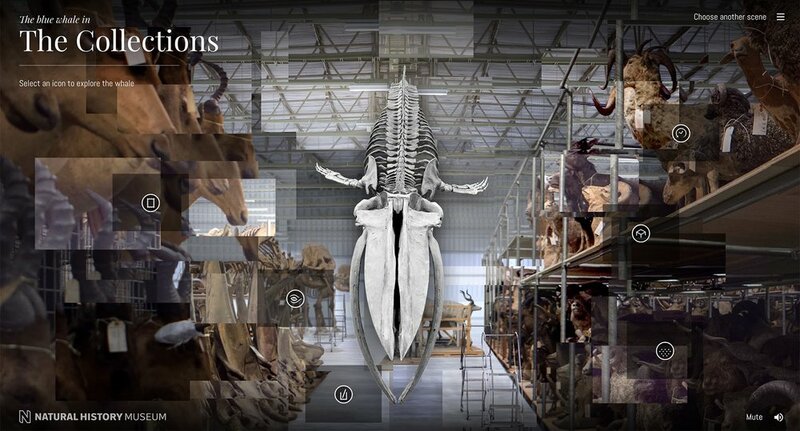 Created to promote the great unveiling of Hope the blue whale in the Natural History Museum's Hintze Hall, this is an explorative and experiential website that takes a look at the long journey she has taken, both during her life and since her death. Found washed up on a beach in 1891, Hope was literally stripped to the bone and sent to the Natural History Museum, where she sat in their permanent collection until 2016. In 2017, the decision was made to remove the iconic Dippy the Dinosaur from its home in Hintze Hall, where it had been on display for the past 100 years. The museum wanted a new exhibit to hang in the hall that spoke more to current precarious state of the natural world, and felt that whales, and man’s complex relationship with them, were a good representation of that. To promote it, the museum wanted to create an immersive online experience that people could explore before they arrived at the museum to see Hope, and to form a more emotional connection to her before they saw her in real life. The site is comprised of three main immersive ‘environments’ that speak directly to the story of this whale. From her time in the ocean and the challenges she would’ve faced, to being held in the Natural History’s Museum’s permanent collection, to the latest stage of her journey, as a new icon hanging in the great Hintze Hall. We worked with the client extensively to map out the whale’s story, and how we could build a piece that would give the user a broader sense of her journey. We wanted to create a site that felt ‘lived in’. To that end we printed out multiple pictures of Hintze Hall and began to cut them up to build deeper scenes. The process involved multiple rounds of cutting and rescanning, again and again, until we had a set of building blocks we could use to build a 3D scene. It was important for us to build this environment physically first, so that we could get a feel for how the layering could work naturally. At the same time, we also started to build the environment template on the computer, using the coordinates we were creating on paper, to create a 3D area we could change on the fly. We wanted the scene to react to the user’s movement and feel like a real space. One we had figured out our scene, we started to map the imagery back onto the 3D space, and could adjust colours and depth accordingly. We also used audio created by the museum to help the user feel fully immersed in this world. Each of the three environments have a series of hotspots scattered around them, which invite the user to explore a wide variety of short stories that revolve around the whale. These include short stories, infographics and videos, many with links out to the wider Natural History Museum site for further information. Given that many of the visitors of the museum will be prompted to view the site when they arrive at Hintze Hall, it was incredibly important that we create a mobile version of the site that felt just as engaging and immersive as its larger desktop version. We made sure that the environments that moved in relation to the user’s mouse, equally responded to how the user tipped their phone or tablet, as well as ensuring that the hotspots were still easily accessible once the screen clicked to a smaller size. Given the public’s love of the Natural History Museum, and particularly Dippy, such a drastic change to the centre piece of the building was never going to go unscrutinized. This put the spotlight very firmly on our site, too, which thankfully attracted a lot of positive press attention, and also won us an Honourable Mention on the Awwwards site.